Following sell-out shows in the Northeast, Rockin’ Road to Dublin is coming to Grand Junction on their first national tour! Come see the show that Irish Dancing Magazine calls “WORLD CLASS … a one-two punch of style and mastery … they made some magic here”. Buy your tickets today and join the crowds raving “there’s more than one road to the heart of Ireland”! Rockin’ Road to Dublin is revitalizing classic Irish art forms and mixing it with Rock-n-Roll to create a new and exciting show like you’ve never seen before. Get ready to experience a new take on Irish music and dance! 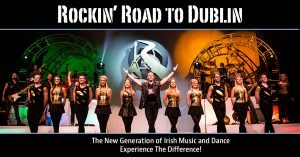 Rockin’ Road to Dublin is the new sensation changing the Irish Dance world. A mix of style and mastery, RR2D’s performance is a medley of fun vibes, highly original choreography, and technical mastery! World Champion Irish Dancer Scott Doherty has teamed up with veteran Celtic rocker Chris Smith to produce this fusion of music, movement, and culture. RR2D is a breathtaking display of classic Irish tunes, jigs, and reels accented by rock riffs, contemporary costumes, and a dynamic light show. Prepare to be amazed as a new generation of performers execute rapid-fire leaps, twirls, and footwork, while fiddlers square off with driving electric guitar chords and pulse-pounding drum beats for a step-dance céilí like no other.